AgeCare Orchard Manor Retirement Community is located in beautiful Brooks, Alberta and offers all the benefits of a retirement living and seniors care in a community environment where making friends is easy, and living is truly worry-free. 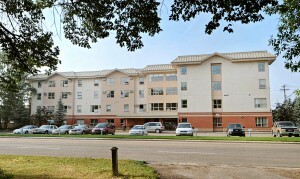 Our private studio, 1-bedroom single and 1-bedroom couple independent suites are the best available in Brooks. The unique design of the community provides a “campus of care” that enables aging in place. As your care needs change, we can accommodate your care by moving from independent living to supportive living. Retirement Living at AgeCare Orchard Manor is for seniors who are looking for worry-free independent living in a friendly, caring, safe and secure environment. Brook’s largest suites, each with individual climate control. Your choice of suites: studio, 1-bedroom single or 1-bedroom couple. I am healthy and content in my studio suite, with my own personal things around me.